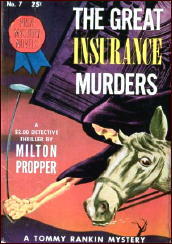 » Reviewed by William F. Deeck: MILTON PROPPER – The Great Insurance Murders. Reviewed by William F. Deeck: MILTON PROPPER – The Great Insurance Murders. MILTON PROPPER – The Great Insurance Murders. Harper & Brothers, hardcover, 1937; Prize Mystery Novels #7, digest-sized paperback reprint, 1943. While seated on a horse during a polo game, Bruce Clinton is shot in the head by a gunman using a .38 automatic with silencer from “less than 200 feet.” “A neat shot, but not too skillful, after all,” Tommy Rankin, Homicide Squad detective, opines. Hard man to impress, I’d opine. “By a system of trial and error, he [Rankin] ultimately cleared up his problems, sometimes even blundering into the answer.” In this novel he is convinced at various times that three separate people were the murderer. Luckily, he does blunder into the answer, leaving profuse loose ends. Should anyone have an urge to read a Milton Propper mystery, this is probably not the one to choose. Parenthetically, certain low-level detectives and obvious crooks say “yu,” sometimes, in place of “you.” Could a kindly Philadelphian, since that city is where this novel takes place, explain the difference in pronunciation? I just bought some Proppers (not this one), hope they aren’t all turkeys. That’s a damned good shot. 200 feet with a silenced .38 automatic — well, since you can’t silence a revolver that makes sense, but anything over ten feet with a silenced automatic would be a heck of a shot. Sounds as if Propper needs to be taken with a sprinkle of salt. If not an entire shaker. Hmm, just read Nevins’ 1977 article on Propper. He cites this one as one of Propper’s three best. Since, alas, Bill Deeck is not around to ask for sure, it is impossible to know if he read the digest-sized paperback edition, which was abridged. I suspect it was, though, and that may be the reason why he said the book leaves “profuse loose ends.” Maybe the ending was trimmed. It does not explain the Miracle Shot, however! Curt, as long as you have Mike’s article there, what three books did he think were Propper’s best?